Recently I spent some time talking with Richard Thomas from NetEvidence, a service assurance company that sells a monitoring tool to allows MSPs, ISPs, IT folk and end-users to gain visibility of the status of their data services. The core proposition that NetEvidence brings to an already busy marketplace is the ability to deliver a monitoring service that can be used at all levels in the ecosystem – MSPs selling bulk services, ISPs selling individual services, IT folk managing organizations service portfolios and end users actually consuming services. Their core tool, Service Assurance Cloud, is intended to make it simple for organizations to connect to cloud-based services and, more importantly, obtain proof that those services are being delivered effectively. 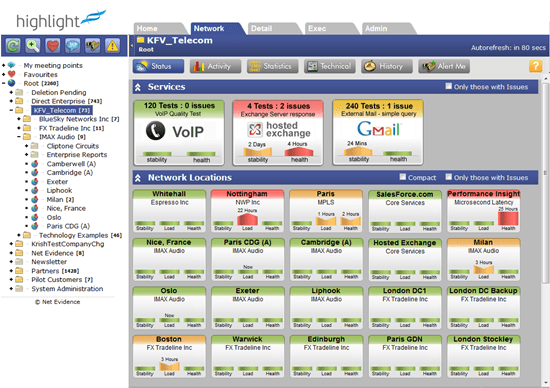 NetEvidence gives visibility across different services – infrastructure, VoIP, email and CRM. A theme I’ve discussed here previously is the need for an integrated monitoring and management tool. I discussed this with Thomas, suggesting that while an end to end monitoring tool is really useful, broadening that tool to allow for a closed loop between monitoring and management is even more useful. Thomas didn’t disagree vehemently, but did feel that given NetEvidence’s particular focus – end-to-end monitoring for everyone involved in cloud provision, acquisition and use – management is secondary to a simple and intuitive interface showing service levels. I like the NetEvidence approach – their tool is intuitive and seemingly simple to use. As for the long term prognosis for a standalone monitoring offering, time will tell.